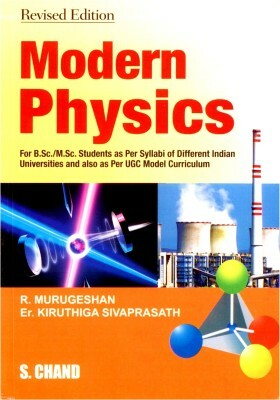 Modern Physics is a comprehensive book for undergraduate and postgraduate students of Physics. The book comprises chapters on relativity, atomic physics, quantum mechanics, molecular physics, nuclear physics, solid state physics, electronics, statistical mechanics, classical mechanics and astrophysics. In addition, the book is presented in a simple and easy-to-understand manner for the students to understand the complex concepts of physics better. Packed with several practice questions and model test papers, this book is a must-have for advanced students of Physics. About S. Chand Publishing S. Chand Publishing is a leading publishing company in India. They have been in the market for more than seventy years and specialize in academic books. They publish books that meet the needs of students from primary level to professional level in engineering, management, commerce, basic sciences and other subjects. They have been recipients of national awards every year. They are the first Indian publishing company to be ISO 9001:2008 certified. S. Chand Group is one of the few publishing houses in India with an in-house integrated publishing solution and with a massive distribution network of twenty four locations throughout the country. Their books conform to the various syllabus patterns of different education boards and universities. Some of the books published by S. Chand Group are ISC Computer Science Using Java for Class XII (Book II), Fundamental of Digital Electronics and Microprocessors, Solutions to Problems in Advanced Accounts Volume II, Retail Management Global Perspective and A Textbook of B.Sc. Maths for 6th Semester.